Be the first to share your favorite memory, photo or story of LaVonne. This memorial page is dedicated for family, friends and future generations to celebrate the life of their loved one. LaVonne Simon, 87, of Winterset died Sunday, February 3, 2019, at the Madison County Memorial Hospital. A memorial service will be held 11 AM Wednesday, February 6, at the First United Methodist Church with Pastor Mark Morehouse officiating. Family will greet friends at the church on Wednesday from 10 AM until service time. Memorials may be made to United Methodist Women at the Winterset First United Methodist Church. LaVonne Evelyn Beier Simon was born July 16, 1931 in Beltrami, Minnesota, the daughter of Elmer and Faye (Bridges) Beier. Her family moved to Hancock County, IA when she was 2 years old. She graduated from Klemme High School in 1948. Following high school, she attended AIB in Des Moines, graduating in 1951 with an Executive Secretarial Degree. She worked at several secretarial and accounting jobs in Des Moines until her marriage. She married Arnold Scott Simon in 1962 and they moved to Winterset in 1963, and she remained a citizen of Winterset the rest of her life. She worked for 3 years as bookkeeper for Dr. Chesnut, Evans, Carson & Rozeboom in Winterset and then was the secretary at First United Methodist Church for 17 years. She became an Editorial Assistant at the Meredith Corporation in Des Moines in 1989 retiring in 1997, after which she continued to work as a freelancer part-time for another 10 years. 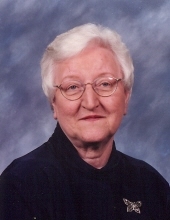 LaVonne was an active United Methodist all her life. Music was also an important part of her life from the time she was 7 years old and began taking piano lessons. She sang trios with her sisters as a teenager and has always been in the choir of whatever church she was a member. She was an accompanist in high school and during the time her children were in the band during their school years, and continued to accompany Winterset Junior High students at yearly band contests for many years after she retired. In 2005 she and a friend, Lou Scholtens, began a ministry playing music in the Winterset care centers and assisted living facilities. She served as President of United Methodist Women and President of Church Women United of Winterset. She also enjoyed embroidery and quilting, and when she wasn’t doing one of those, you’d find her reading a book. She was an avid Iowa Hawkeye and Chicago Cubs fan. She is survived by her sons, Tim Simon of Urbandale and Marc (Renee) Simon of Candler, FL; brothers, Bob (Donna) Beier of Pleasantville, Ronald (Virginia) Beier of Shevlin, MN, Jim Beier of Newtown, PA, and Roger (Linda) Beier of Byron, MN; sister, Joann (Roger) Hansen of Kanawha; brother-in-law, Douglas Doolittle of Webster City; sister-in-law, Jane Beier of Klemme; three grandchildren; five step-grandchilren; and six step great-grandchildren. She was preceded in death by her daughter, Karen Zeutenhorst; her parents; brothers, Eugene and Gordon; and sisters, Beverly Thorson, Shirley Doolittle, and Janis Smith. Online condolences may be left at www.caldwellparrish.com. Arrangements were handled by Caldwell Parrish Funeral Home – Collins Chapel in Winterset. Family will greet friends from 10 AM until service time. "Email Address" would like to share the life celebration of LaVonne B. Simon. Click on the "link" to go to share a favorite memory or leave a condolence message for the family.